The Canary Islands archipelago is just off the north-west coast of the Western Sahara and has long been famous as an all-year round sunshine holiday destination. There are seven main islands in the group which are all surprisingly different to each other. From west to east these are as follows: El Hierro, La Palma, La Gomera, Tenerife, Gran Canaria, Fuerteventura and Lanzarote. In addition, there are a number of smaller islets, of which La Graciosa, to the north of Lanzarote, is the only one inhabited. 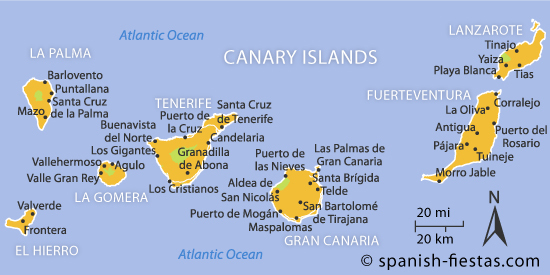 The autonomous community of the Canary Islands is divided into two Provinces: Las Palmas de Gran Canaria being the eastern province and Santa Cruz de Tenerife the western one. Although originally Las Palmas de Gran Canaria was the regional capital, there are now joint capital cities. At its closest point only some 95 km from the African coast, the Canary Islands rise from the Jurassic ocean crust and, along with Cape Verdi, the Azores and the Savage Isles are part of Macronesia. All of the islands are volcanic in origin, although of vastly different time periods. Mount Teide, on Tenerife, is not only Spain’s largest mountain peak but also the world’s third largest volcano. La Palma has been the subject of much scientific research and/or wild speculation with regard to being the island that could cause the tidal wave that destroys the eastern seaboard of the USA, and its active volcano is being constantly monitored. All of the islands are mountainous and the further east one travels, the more desert-like much of the landscape can become. There are no rivers in the Canary Islands although, after heavy rainfall, the deeply cut barrancos can run with water quite ferociously. Pliny the Elder and Homer – and perhaps Plato in his references to Atlantis – wrote about the Canary Islands and throughout early history they were known as The Fortunate Isles, the Summits of the Atlantic and the Garden of the Hesperides. Phoenicians, Romans and Arabs all colonised the islands but they were previously inhabited by native guanches probably of North African Berber origin. It was the Romans who first gave the name Canaries to the islands – because of the dogs that were prevalent there. So the islands were named after the dogs; the birds were named after the islands! It was in 1402 that the Castilian forces first came to Lanzarote and other islands, led by Jean de Béthencourt, who became King of the Canary Islands. It took until the end of the century, though, to fully overcome the fierce resistance of the indigenous people and in 1496 the islands became part of the Kingdom of Castilla. The Canary Islands proved an ideal place to use as a base for voyaging to the Americas – indeed, they still are as cruise ships call in, and tall ships and yacht races frequently call here or start from here. The strategic importance of the archipelago led to attacks from the Turks, the Dutch and the English – Admiral Lord Nelson lost his arm in a sea fight off Tenerife – but the Spanish successfully kept control. Thanks to the lack of light pollution in the skies of the Canary islands some of the world’s most powerful observatories are located here including those in NASA tracking stations. The economy of the islands had been established mainly around the growing of sugar cane but during the 18th and 19th centuries this market became dominated by the Americas and the Canaries suffered an economic downturn. As a result there was mass emigration to Venezuela, Ecuador, Puerto Rico, Cuba and other parts of Central and Southern America and it wasn’t until the banana was introduced as a replacement for sugar cane at the end of the nineteenth century that the region started to recover. At this time, many British and other European businesses also came, helping the infrastructure develop enormously. Franco was appointed Commander of the Canary Islands in 1936 – in order to try to get him as far away from Madrid as possible – but it was from here that he was called to lead the military uprising that led to the civil war. There was little resistance to the military in the archipelago but the regime after the war was particularly harsh on this area, leading to a great feeling of resentment. It emerged a few years ago that Franco himself was so concerned about the islands that at one stage he tried to sell them to Portugal and then, a few years later, he offered them to the USA as part of a deal for having bases in Spain. With the development of tourism during the last 50 years or so, there has been much more migration to the Canary Islands from the mainland of Spain and they now have a very Spanish feel to them. In spite of such migration most true Canarian people are still very proud of their guanche heritage and their traditional culture remains very active. Although the Guanche language of the indigenous peoples is extinct there are still some remnants of it in the local Spanish dialect – which even Spanish visitors from the peninsula often find difficult to understand. What is more peculiar is the presence of words adopted from the English such as ‘queque’ meaning cake and ‘guagua’ which means bus and was originally the way the local people pronounced the English word ‘wagon’ at the beginning of the twentieth century. In La Gomera there is a whistling language that was developed to allow people to communicate across the wide ravines of the island and this is still in existence – but mainly for the benefit of tourists nowadays. The Canary Islands have sometimes been known as the ‘islands of eternal spring’ because of their year-round pleasant weather. Basically, there is warm, sunny weather for most of the year with summer temperatures rarely becoming too hot – the maximum is about 28°C in most places – and the winter rarely dropping into single figures at night except in the mountains. However, the further west you travel, the wetter the islands become, with the result that Hierro and La Palma are far greener than Lanzarote and Fuerteventura. Similarly, because of the inland mountains, both Tenerife and Gran Canaria have much more rain in the north of the island than in the south – hence the major tourist areas being in the southern parts. The Trade Winds are part of the reason for the mild conditions and they tend to be stronger in the summer than in the winter but occasionally they can veer in direction and come from the Sahara, resulting in a hot, sand-carrying wind, a calima, which can be quite unpleasant. Most visitors to the islands arrive by plane with both charter and scheduled flights from all over the continent serving the major airports. If you are flying to Tenerife and are going to be based in the south, then try to select a flight to that airport as it can be a lengthy journey from Tenerife North if you should land there. The three smaller islands also have airports and the local airline, Binter Canarias Airways, operates many flights between them all each day if you want to ‘island hop’. There are various ferry services between the islands that offer a cheaper alternative to flying and most of them cater for both foot passengers and those with cars. Once on the islands you will discover that the largest of them have major motorways connecting the airports with the main tourist areas and roads in and around towns are generally of a good standard. Mountain roads, however, can sometimes be rather daunting until you are used to them and take note, Canarian drivers are often worse than their mainland counterparts! For accommodation recommendations take a look at Booking.com’s vast selection of hotels and apartments throughout the Canary Islands. There are no rail services on the islands but they all have frequent, cheap bus services – it is best to have a season ticket if you intend to travel on them frequently; they are known as ‘bonos’ and can save you as much as 50% of your fare. More than one third of the GDP of the Canary Islands comes from tourism. Gran Canaria and Tenerife are the two most popular destinations with visitors and they are perhaps the two most similar of all the Canary Islands. Both have their major centres of population in the north of the island, a very attractive and green mountainous interior, and huge resorts in the south. Both islands also have areas – such as Puerto Rico in Gran Canaria – that originally catered for the budget end of the market but have since tried to reinvent themselves by adding some all-inclusive and higher quality hotels. The two islands have perhaps suffered in many ways because of their ‘cheap and cheerful’ reputations but they can offer much to the most discerning of travellers. The interiors are quite spectacular, dotted with attractive villages clinging to the mountain sides, and both have capital cities with architecture and atmosphere that can rival similar cities in mainland Spain. Meandering through the old town of Tenerife or along the spectacular city beach, Las Canteras, in Las Palmas can prove to be a rewarding experience. The westward islands are true paradises for walkers and nature lovers. La Palma, with its wonderfully scenics walks around the volcanoes in the south or the Caldera, the enormous crater that dominates the north of the island, is known as ‘La Isla Bonita’ and there really cannot be many more beautiful places in the world. Driving around can require strong nerves and a good sense of direction but even if you do get lost the island is only 50km by 25km at its widest so it won’t take too long to orientate yourself. All three of these smaller islands, Hierro, La Gomera and La Palma, offer peaceful holidays which are light years away from the popular perception of the Canary Islands. Fuerteventura has some spectacular wide, sandy beaches and is a delight for water sport enthusiasts. As the name implies, wind surfing and kite boarding are immensely popular here with regular World Championship events being held. Lanzarote is in many ways a good example of well-controlled tourism. Because of the influence of the artist and architect César Manrique, strict regulations were introduced – still in place today – to govern the development of the island. There are no high rise buildings in Lanzarote and strict rules to follow about where and what developments can be built. Manrique’s influence is all around the island – sculptures on roundabouts; his fascinating house built into the volcanic landscape; the incredible Jameos del Agua, with an underground concert hall constructed in a volcanic ‘bubble’; and the Mirador el Rio, overlooking the nearby island of La Graciosa. More than anything, though, the abiding memory of Lanzarote will be of the lunar landscape and the astonishing Timanfaya National Park. Windsurfers, kite boarders, mountain climbers, walkers, cyclists, divers, golfers, bird watchers, naturists, sea fishermen – these are just a few of the many activities available in the islands. The respective island tourist boards have assembled excellent guides for walkers and tourist trails for those with varied interests. The ideal aspect for many, of course, is that these activities are possible throughout the year – there is no real ‘off season’. The Carnivals of Santa Cruz de Tenerife and Las Palmas de Gran Canaria – both of which stretch over three weekends in February or March – are famous throughout Spain because of their vibrant atmospheres. These are truly spectacular occasions. Maspalomas, in Gran Canaria, also has a Carnival worth seeing, if only for the unforgettable Carnival Drag Queen festivities. Las Palmas has an annual Womad festival in the autumn that attracts many international artists and both of the main islands have an impressive array of Jazz and Classical Music Festivals each year. The Canary Islands’ two most notable additions to Spanish cuisine are mojo and gofio. Mojo is a very spicy sauce made from garlic and peppers. It is usually red but you can also have a green version. It is served with most fish dishes here but also with the ubiquitous Canarian potatoes known as papas arrugadas. This literally means ‘wrinkled potatoes’, because they have been boiled in their jackets in very salty water until they are wrinkled. Gofio is a roasted mixture of wheat and grain or barley. Canarians tend to eat this with everything – as a breakfast cereal or just pouring it on soups or stews. It is an acquired taste and my recommendation would be to have it as a dessert, usually as Mousse de Gofio, where it has a pleasant rather rich and nutty taste. Other Canarian dishes include watercress soup (‘Potaje de berros’) and a lovely broth known as ‘Rancho Canario’. Spanish speakers might be surprised to see ‘Ropa Viejo’ – old clothes – on local menus. This was formerly a peasant dish made up of all the left over meat and vegetables from previous meals but is now often put on as a tapas speciality. Obviously, fish is plentiful and fresh here but there is also plenty of pork, rabbit and goat to be had and the goats’ cheese can be delicious. For many, though, the sheer freshness and tastiness of locally grown avocadoes, mangos, oranges, tomatoes, strawberries, etc., grown all through the year and available at local markets is what really attracts about Canarian eating. Wine is produced grown on the islands which has a distinctive flavour because of the volcanic nature of the soil. Best known are the wines of Lanzarote, especially El Grifo, a clean, crisp dry white wine that deserves a wider reputation. Many residents drink locally produced rum – a thriving remnant of the sugar industry. You might well be given a small glass of ron miel, the native honey rum, at the end of a meal. If you are, then I hope you have a sweet tooth! Are you a regular visitor to the Canary Islands? Is it your winter holiday destination of choice? Any comments and useful tips for our readers are welcome below. Dear Gerry, My husband I had a super holiday in the Canaries a few years ago, and loved every minute, The variety is incredible from one area to the other. We had stayed at the Catalina Hotel for a bit of old world luxury, then at the Parador. There was where we were amazed at the landscape in the “Canada”, and the surrounding villages and beaches kept us busy each day. Your article is spot on, but I missed the “artesania” of the region, especially the beautiful embroidery/lace. It is one of the few remaining places in Spain where the artisans continue to ply there art and well worth the trip for anyone interested in the unique value of hand made items. Throughout the country this is, sadly,disappearing and should be supported not only by the local governments, but the tourist industry as well.